Smartwatches are changing the rules: from the way companies design for the wrist to the experience for consumers, when it comes to wearables, everything is different. When it comes to design, the Apple Watch has taken a brave direction. Apple has been bolder than nearly any mainstream wearable manufacturer by offering far more functionality from the wrist, and opening up to third party developers. And why wouldn't they? It's a model of success that's worked time and time again. But smartwatches are different. When you look at a watch, you want it to tell you something – normally the time. Google does this quite effectively and Google Now is designed to flash up the right information, at the right time. And it works, to an extent. However, this is where Apple lags. It's all too often ignored, but Apple's services just aren't that great – and it's holding back the Apple Watch from reaching its full potential. Navigation is a big part of the Apple Watch's use cases, and for those that live in cities, discreet walking directions are an important feature. With Google Maps yet to branch out to the Apple Watch and CityMapper hobbled to be less than useful, Apple Maps is the Watch's main purveyor of turn-by-turn directions. Picking on Apple Maps is a bit 2012, but we fully expected the service to have improved. We were very wrong, and the service has consistently let us down. Firstly, where Google Maps offers multiple walking route options, Apple Maps only offers one. And when we were out on our route, it seemed to treat us like a car, with equally bizarre walking directions, as can be seen from the screenshot below. The same evening, we turned the wrong way out of a pub to walk back to the nearest Underground station. However, Maps and the Watch colluded to have us walk 15 minutes in the wrong direction, before advising us to turn around. While Maps has been much maligned, we also need to talk about iMessage. 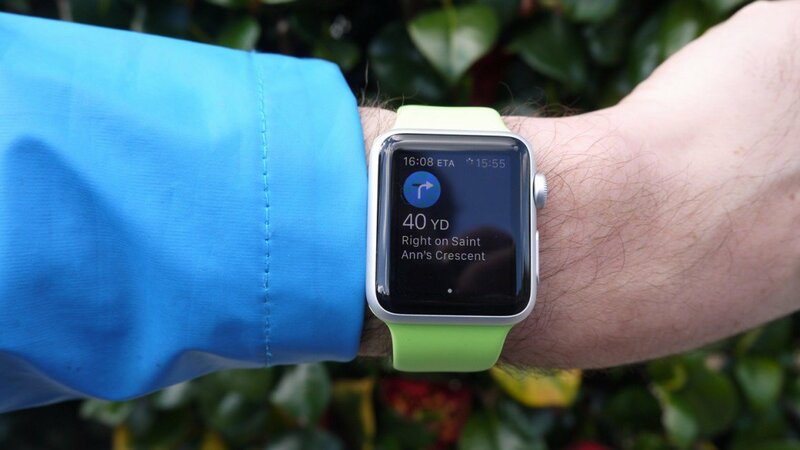 On the Apple Watch, it's the only messaging app that enables users to reply to messages from the wrist. Again, that makes iMessage an important part of the Apple Watch experience – after all, Facebook Messenger, and don't enjoy the same functionality. Yet again, iMessage is also not up to scratch. When we tested the feature with friends, iMessages simply didn't arrive on our iPhone, let alone the Watch. They appeared on our MacBook the next day. It's another example of a key service of the Apple Watch, which simply doesn't work as it should. With the Watch such a personal item, it highlights and accentuates problems. If your Watch navigates you in the wrong direction, that's a big problem. If your messages don't show up, same goes. It adds to a host of services from Apple, which aren't at the quality we'd expect. Apple Health is vastly undercooked, iTunes lags behind the quality of third party apps like Spotify. And that's the issue: until the third parties build in the functionality enjoyed by Apple's own apps, the Apple Watch will be unable to reach its full potential. What are your experiences with Apple services and the Watch? Let us know in the comments below.